Dipotassium glycyrrhizinate is a salt of glycyrrhizic acid that exhibits several properties that make it useful for cosmetic purposes. Glycyrrhizic acid is also known as glycyrrhizinic acid or glycyrrhizin. It is extracted from licorice (Glycyrrhiza glabra). However, due to glycyrrhizic acid being poorly soluble in water, its potassium salt is frequently utilized instead in skin care products. Dipotassium glycyrrhizinate is a substance well known to the medical community because it has been investigated as potential treatment for several disorders. For example, in Japan it is used as treatment for chronic hepatitis due to its potent antiviral effects. Its beneficial properties can also be transferred to skin care because this licorice constituent displays prominent anti-inflammatory, anti-irritant, anti-aging, anti-psoriatic, anti-allergic and immune modulatory effects.. Skin aging can be caused by several factors, including the negative influence of free radicals, trans-epidermal water loss and diminished collagen replacement, among others. Glycyrrhizin exerts anti-aging effects by affecting some of these physiological changes that take place in the human skin, including potent anti-oxidant properties ,,. Dipotassium glycyrrhizinate can be safely incorporated into various cosmetic products because it exhibits no toxicity, as concluded by experts who evaluated various glycyrrhizic acid derivatives . Glycyrrhizin possesses anti-inflammatory properties due to its ability to slow down the metabolism of cortisol, which is a hormone that is implicated in the stress response, but also in the regulation of immune processes ,. Inflammation is caused by the release of several bioactive molecules, such as prostaglandins and leukotrienes. These pro-inflammatory molecules produce dilation of blood vessels and function as a signal for immune cells to concentrate in the specific area of the body where damage to the tissues, abnormal bacterial proliferation (infection) or irritation have occurred. Signs of skin inflammation (found in dermatitis) may include redness, swelling, itching, “burning” and even pain. Cortisol diminishes the immune response and thus contributes to inflammation resolution. Dipotassium glycyrrhizinate exerts its anti-inflammatory effects by inhibiting the metabolism of cortisol, which leads to a prolonged half-life and remission of the immune response. Glycyrrhizin also has the ability to decrease the production of prostaglandin E2, which also facilitates the reduction of skin inflammation . 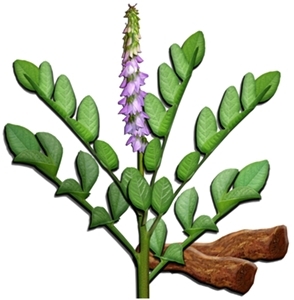 This compound (alone or in the form of licorice extract) is widely used in the treatment of atopic dermatitis as a potent anti-inflammatory agent , , . Glycyrrhizin is currently investigated in clinical studies as a potential treatment for psoriasis . An allergic reaction is accompanied by histamine release from mast cells (also known as degranulation), which causes skin allergy symptoms such as inflammation, itching or skin rash. Glycyrrhizin and its derivatives can ameliorate allergies by inhibiting the degranulation of mast cells, which limits the amount of histamine released into the bloodstream, and by improving the local immune response to an allergen, resulting in a faster resolution of symptoms ,. Glycyrrhizinic acid is soluble in ethanol only, whereas Dipotassium Glycyrrhizinate is water soluble, thus making it easier and less irritating to use. Cosmetic Ingredient Review Expert Panel (2007).Final report on the safety assessment of Glycyrrhetinic Acid, Potassium Glycyrrhetinate, Disodium Succinoyl Glycyrrhetinate, Glyceryl Glycyrrhetinate, Glycyrrhetinyl Stearate, Stearyl Glycyrrhetinate, Glycyrrhizic Acid, Ammonium Glycyrrhizate, Dipotassium Glycyrrhizate, Disodium Glycyrrhizate, Trisodium Glycyrrhizate, Methyl Glycyrrhizate, and Potassium Glycyrrhizinate . Soma R, Ikeda M, Morise T, Miyamori I, Takeda R (1994) Effect of glycyrrhizin on cortisol metabolism in humans.